Step 1 Choose your INAB (Irish National Accreditation Board) accredited Certification Body. Step 2 Complete the Certification Application Form to apply to undergo assessment for registration against your chosen ISO standard(s). 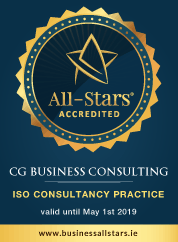 Step 3 Contact CG Business Consulting to help you establish, document, implement and audit your chosen ISO management system. This audit involves the external certification body assessing your company’s documented management system against the requirements of the relevant ISO standard(s). The Auditor at the end of the Stage 1 assessment will inform you if they are recommending the company to proceed to the stage 2 Registration Assessment. CG Business Consulting will assist you in completing and closing any non-conformances or observations raised during the external preliminary assessment. This is the final assessment of your management system. A comprehensive and objective review of the company’s procedures and practices will be carried out against your management system (reviewed in the stage 1 preliminary assessment). The Auditor will look for records (i.e. proof) that the management system is operated as the documented system says it should be, is fully aligned to the standard and is fully operational within your organisation. On completion of the assessment the Auditor will present the findings of the assessment in a written report to you and any issues will be raised if appropriate.